When first hearing about Dragon Age, I unfairly passed it off as yet another Dungeon and Dragons imitation that lacked any real substantive character development or witty dialogue. For the most part, I’m often very flippant when it comes to making some very unfair generalizations on a lot of things. Over the years, some of my favorite television shows, movies, or books were formerly things I was highly dismissive of due to a strong belief in the stigmas attached to certain genres. Its a pity then that I almost completely overlooked Dragon Age only to sit down one day and become greatly immersed in a video game that was a true cinematic experience. More importantly, the character development was outstanding; each character was nuanced and the dialogue was one of the best features of the game. Normally, dialogue is a secondary goal when it comes to game development, but the dialogue for the first Dragon Age was sharp and witty. It was the type of witticism that made me become an avid Buffy and Angel fan. One of the writers responsible for the great dialogue was David Gaiden, who alluded to Buffy in an interview for inspiration behind the creation of such inimitable characters like Alistair or my personal favorites: Morrigan (voiced by the lovely Claudia Black from Farscape fame) and Zevran. Ever since playing this game, I have had heightened expectations for the narrative potential of video games. When reading Buffy Season Eight comics, I also had an increased awareness of the vast artistic potential of graphic novels. 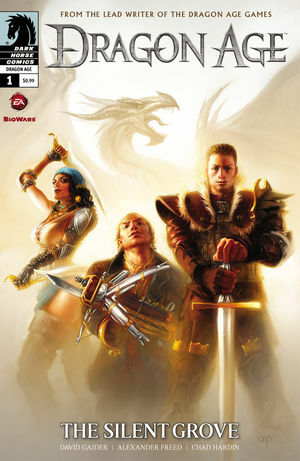 Admittedly, I’m not a walking encyclopedia when it comes to Dragon Age, so it was very nice that this comic was very accessible for those who love the game, but are not huge, fervid fans of it. There are some people that I know that can recount every bit of exposition from the game in the same way that friends of mine can remember every fragment of that same type of information in Song of Ice and Fire. I’m not that type of reader. Normally, I’m far too attentive to the characters that I often forget about what I perceive as secondary details that are very important to authenticating the universe in the story, but are not nearly as important as developing the characters to the extent where they are humanized. This was one of Dragon Age’s strengths, so it was a surprise to me that the characters within this comic book are not nearly as well developed. Actually, the sidekick characters seem a bit more subdued than either Zevran or Morrigan in the game. Instead of these richly fascinating characters, we have Varric, a dwarf and underworld merchant;and Isabelle, a ruthless pirate. Their past histories are lightly glossed over in favor of moving the action at a quicker pace, even Alistair seems a bit more stoic than I remember him being. In the game itself, he was rather gregarious. At times, he did brood at certain appropriate intervals whenever he would confide some details of his past history. Yet, within this comic, the full range of dimensions for each of these characters is limited due to the comic format. In the Buffy season eight comics, this was an initial problem that was rectified in later volumes. Perhaps, the same thing will occur here. I might need to be patient for further volumes of the comic to expand on the new characters, and also strengthen Alistair’s humorous side. One of the best features of Alistair was his levity. He is not a perpetual brooder by nature. In terms of the plot, the plot itself was very intriguing, as it deals more extensively with Alistair’s insatiable need to find his father. With Alistair’s weakened presence in this comic though, it was hard to feel the weight of any emotions related with this supposed void within his life. In the game itself, the weight was much stronger. Then again, video games are a more expansive medium, whereas comics are often limited to a few panels and a low number of volumes, thus writers have to be meticulous when trying to write effective dialogue and plot details. Sometimes, the art itself has to compensate also for the limitations of this concise writing. Luckily, the art was very stylized and really enhanced the entertainment factor for this comic. When the characters and plot were lacking, the vibrant, detailed drawings really helped to counterbalance those weaknesses and immerse me what is an exciting read. While it was severely lacking the high quality of the game’s plot and character development, I still was greatly compelled to continue reading. By the end, the characters were even fleshed out a bit more, and I was actually dismayed to find that there remains to be a second volume that continues a story-line that might initially feel lackluster, but the ending really shed light on its great potential. Final Verdict: Of course, video games as a medium inherently have greater room for stronger plot and character development. Comic books are sometimes misjudged as being a limited medium just because some comics have fallen victim to these limitations. Rather than harshly judge the Dragon Age comic against the video game, I realize that this comic book is a very strong effort from the team that worked on it. While the plot and character development may feel stunted in the first volume, this comic book adaptation also effectively has an awesome brisk pace that made it a very entertaining read overall. For any Dragon Age fans in particular, this is a very respectful adaptation of a great game, even if it sorely lacks the high standards of the first game. Perhaps, subsequent volumes will only continue to develop the plot and characters further. For now, the first volumes works like a standard pilot episode of a TV show that requires careful construction of a story that could easily deteriorate into a muddled mess. For now, I have high hopes that the next volume will only expand the potential of what is a pretty good comic adaptation. of an awesome video game. Thank you Netgalley & Dark Horse Comics for this advanced copy! !